Spiceworks launched a new report today –Future of IT: Hype vs. Reality – that examines organizations’ adoptions plans of emerging technology like IoT, AI, VR, and 3D printers and the expected impact in the workplace. The survey results show that among these emerging technologies, IT pros expect IoT devices and AI technology to have the biggest impact in the workplace. They don’t expect mass adoption to take off for VR and 3D printers, but some industries have significantly higher adoption rates than the industry average. This report, like all reports from Spiceworks, is excellent and accurate. There’s a lot of hype around virtual reality (VR) tech and it will have some adoption in universities and in specialty businesses, but for most of us, don’t invest too heavily in anything VR-related. 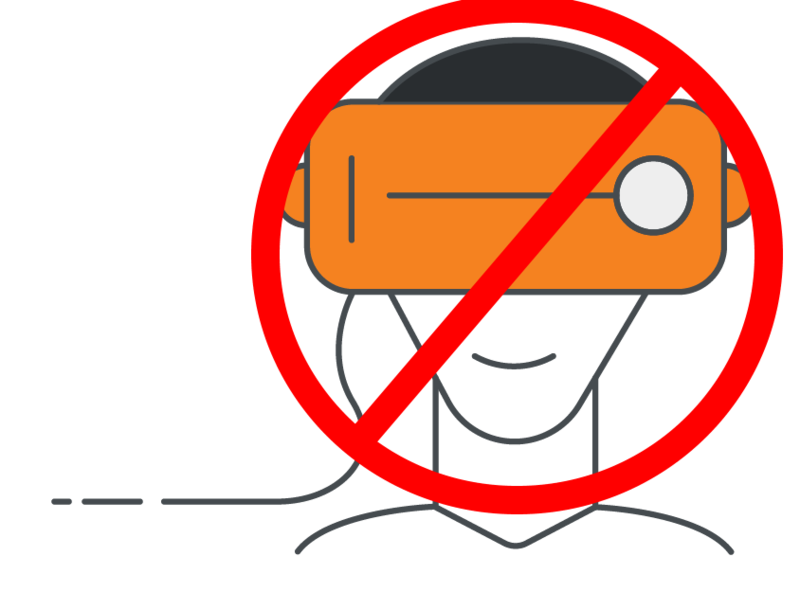 Most businesses don’t need VR and those that do, already have it in some form. One point I disagree on, and it’s not uncommon for me to do so, is artificial intelligence (AI). For the past many* years, I have thought that AI would be the one technology that really surpassed all the others in terms of adoption, especially for voice-controlled applications, like Siri, Alexa, and Cortana. I’ve waited for 20 years for a decent voice-recognition program so that I don’t have to type, but can just dictate. Yes, I know about Dragon, and it’s pretty good. But I want something that’s truly ready for prime time. For me, voice recognition is the first step in AI. Once you have voice recognition, then you can create programs to respond to commands and to perform complex functions. I need for it to be better than my R2D2 robot and the current state of Siri, Alexa, and Cortana. There are a lot of applications for voice recognition, but we just haven’t tapped into them yet. Overall, this is a very thorough report. I like the visual statistics and the comparisons. I think that you’ll find it enlightening. Use the Comments section to tell me how closely these statistics come to your reality. *many – A bunch. More than I’m going to tell you about. SAN FRANCISCO – April 7, 2015 – Embarcadero Technologies, a leading provider of software solutions for application and database development, today released Embarcadero® RAD Studio XE8, the connected app platform for Windows and beyond. This major new release of RAD Studio enables Delphi/Object Pascal and C++ developers to leverage their Windows VCL applications and build expanded, innovative solutions for mobile, cloud and the Internet of Things (IoT). RAD Studio XE8 delivers easy-to-add connectivity and mobile-platform support for developing distributed, connected apps – for Windows, Android, iOS, OS X, IoT gadgets and devices, middleware, cloud, and enterprise services. Featuring new iOS 64-bit and Universal App support, RAD Studio XE8 enables development teams to easily add IoT features, like proximity awareness with beacons, improve app performance and developer productivity, and better understand user app behavior. The new GetIt Package Manager provides easy discovery of source code libraries, components, and more from within the IDE. iOS 64-bit and Universal App Support: To deliver new apps to the Apple App Store, the XE8 version of RAD Studio features new iOS 64-bit Object Pascal and C++ compilers, including linkers and tools to build an iOS 64-bit target. RAD Studio XE8 supports Apple Universal apps, offering both 32-bit and 64-bit binaries in a single package as well as a wide range of iOS platform native controls to deliver a highly specialized iOS user experience. Multi-Device Form Factor Preview: Developers can build connected apps faster with the Multi-Device Preview in RAD Studio XE8, a valuable visual tool that allows developers to see their user interface on all target form factors at once, from which they easily identify which form factors need additional optimization. The Multi-Device Preview features live previews of any number of target form factors and orientations including desktop, tablets, phones, and smart watches. Proximity Awareness with Beacons: New component-level beacon support in RAD Studio XE8 makes it incredibly easy to add proximity and location-awareness to existing Windows and mobile apps. AppAnalytics: To better understand user behavior, AppAnalytics captures anonymous usage statistics on how users are using applications built with RAD Studio XE8. AppAnalytics is a hosted, pay-per-use service that offers VCL and FireMonkey support to embed into existing Windows applications as well as OS X, Android and iOS apps. GetIt Package Manager: Hosting both VCL and multi-device libraries and components, the GetIt Package Manager provides easy discovery, download and update of source code libraries, components, and other features from Embarcadero GetIt servers – with one-click installation. It includes all TurboPack projects. Upgraded Enterprise Mobility Services (EMS): EMS is a turnkey, on-premise solution for mobilizing distributed, connected apps, and is now equipped with Push notification server support for iOS and Android.  Based on open standards and technologies, EMS offers an easy-to deploy middleware server that delivers user authentication, custom REST APIs management with analytics, an embedded and server side secure database, and data access to major Enterprise databases like Oracle, SQL Server, Informix, DB2, PostgreSQL, MySQL, and much more. Other enhancements in the XE8 version of RAD Studio include: major developer productivity boosters from the integrated Castalia plug-in with Object Pascal refactoring; Project Statistics; Code Analysis; and time-saving code editor shortcuts. The new configuration settings migration tool assists in migrating configurations of older versions of the product to a newer version or between different installations of the same version. RAD Studio XE8, Delphi XE8 and C++Builder XE8 are available immediately from Embarcadero and from Embarcadero partners. Visit the Embarcadero online store athttps://store.embarcadero.com/ for pricing. To download a free trial, visit http://www.embarcadero.com/products/rad-studio/downloads. RAD Studio XE8 launched by @EmbarcaderoTech. Extends Windows apps to mobile, cloud and IoT. Embarcadero Technologies, Inc. is a leading provider of award-winning tools for application developers and database professionals so they can design systems right, build them faster and run them better, regardless of their platform or programming language. Ninety of the Fortune 100 and an active community of more than three million users worldwide rely on Embarcadero products to increase productivity, reduce costs, simplify change management and compliance, and accelerate innovation. Founded in 1993, Embarcadero is headquartered in San Francisco, with offices located around the world. To learn more, please visit www.embarcadero.com. I have loved home automation products for as long as I can recall. When the X10 stuff first came out, I bought a $100+ starter kit that included lamp timers, a control unit, a motion sensor or two, and a remote control. There were possibly other components included that I can’t recall, but it was expensive and I never got any of it to work. Until I received the TCP Starter Kit, I hadn’t been hopeful home automation products impressing me enough for a purchase. 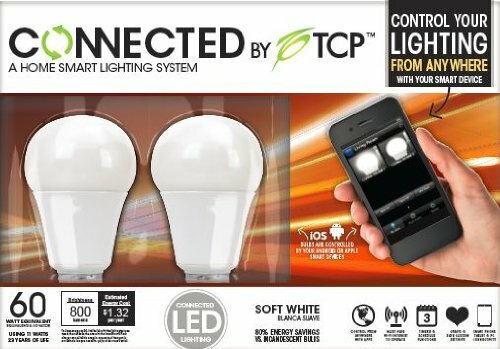 The TCP Connected Home Lighting System Starter Kit (Kit) that I review here contains two 60W equivalent LED light bulbs, a wireless gateway unit, an Ethernet cable, and an instruction booklet. It only requires a few minutes to install the bulbs, gateway, and to setup your app to control them. It’s so easy that I didn’t have to read the instructions, although I recommend that you do so. Install the bulbs just as you do any other bulbs. Plug the wireless gateway unit into your network router or a switch via the included Ethernet cable and plug the unit into a power source. With your lights turned on and your gateway powered up, install the TCP app, that’s searchable and downloadable from your app store. Once installed, open the app to allow it to locate your gateway. Once you do that, follow the easy instructions to setup and customize your lights. I like that you can actually take a picture of your light fixture with the light on to represent the connected light that you’re using. In the video, I demonstrate using the app, turning on, turning off, dimming, and brightening the lights. I have one of my two TCP connected lightbulbs installed in my front porch light fixture and the other installed in a lamp in my living room. The answer, according to the documentation is, “Yes.” However, I’ve not been able to get it to work, so I personally can’t say for sure either way. If it does work, that’s a great feature. Who doesn’t want to be able to turn on his or her lights remotely so that the lights are on when you come home in the evening? I’d love to have that feature. 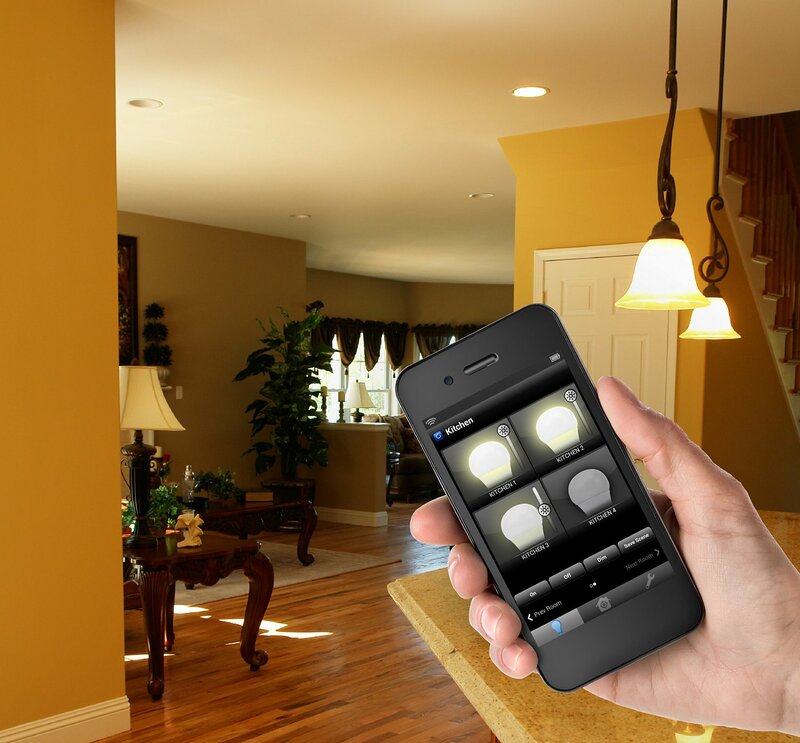 You can create a Smart Control, which is a program to control your lights in a particular way. Default ones included are: Home, Away, and Night. You can add and customize your own. I have setup and used this feature and it works quite well. It requires a little experimentation to get exactly what you want, but you have a lot of options and presets to help you along. Why it’s Frugal: The Kit is frugal because it helps protect your home inexpensively. For as little as $70, you can have a little peace of mind that your lights back home can be controlled on a schedule or randomly by your own hand. The bulbs are rated for a 20+ year lifetime. Plus, you can add dozens of lights to your network to make your home fully automated and to look as if someone is there 24×7. As you saw and heard in the video, I stated that the ability to control your lights without using the switch is a great feature. My reason for saying this is that often I like to see who’s at my front door without allowing that person to see me near the door. That gives me the advantage should that person be a potential intruder. I like the TCP Connected Automated Home Lighting System. I think that even having two controllable lights at your disposal is a huge safety boost for you and your family. And for the starter price of $70, it’s not bad. You can add extra lightbulbs at around $20 each. That sounds like a lot until you realize that these bulbs are rated for 25 years of use. DURHAM, N.C., June 4, 2014 – GFI Software™ today announced the findings of an extensive independent research project examining the “Internet of Things” (IoT) and the impact IT administrators expect from the increased volume of internet-enabled and addressable devices on their network. Respondents overwhelmingly cited greater exposure to existing and undiscovered threats, particularly from mobile devices, as among their most pressing concerns about the onward march of the Internet of Things into their organization. The survey of 202 IT decision makers in U.S. workplaces employing up to 250 people was conducted by Opinion Matters for GFI Software, and revealed that the growing relevance of IoT for small and medium-sized businesses (SMB) means growing security threats, greater device management challenges and increased costs for IT management. Analysts expect the number of devices – or “things” – that will connect to the Internet to grow radically by 2020, with Gartner estimating that 26 billion addressable devices will find a home on a corporate network. This spike in connected devices will create billions of new unsecured endpoints that will in turn produce new vectors of attack designed to either compromise the device or gain access to the infrastructure. Disruption is a significant concern, as 96.5 percent of IT decision makers surveyed said that IoT would produce at least some negative impacts for their organizations, with more than half (55 percent) saying it will impose new security threats while extending existing threats to a greater number of devices. Furthermore, 30 percent said IoT will result in an increased IT spend, while 26.7 percent expected device management to spiral out of control as a result of the rise of IoT. 14 percent expect that deploying patches across multiple platforms will present a particular challenge. Each new modern innovation requires adaption to new technologies – not only to take advantage of the new opportunities, but also to adjust to the new problems that inevitably arise from it. So it goes with the Internet of Things, as more than three-quarters (78.6 percent) of IT administrators expect their security practices to change as a result of IoT. Among these changes, nearly one-third (30 percent) expect to have to revise policies about connectivity in the workplace to manage this adaption. The increasingly prominent role wireless devices play in the daily lives of employees results in greater security risks in general for an organization. When it comes to IoT, the risks from mobile devices become particularly acute, according to survey respondents, 81.7 percent of whom indicated that mobile devices create the most potential as a point of exploitation in the IoT age. Existing anti-spam, anti-virus and anti-malware infrastructure may not do the job of protecting against the multitude of risks posed by the billions of insecure new endpoints. When asked to rank priority areas of security focus, 45 percent of IT decision makers surveyed pointed to firewalls as their very top priority, while 35.7 percent cited mobile device management. Anti-virus was cited as a top priority by less than a fifth (18.7 percent) of respondents. I am always looking for article ideas and topics from readers, companies, PR folks, friends, and techies. This page is where I post my current needs. I have a variety of venues for articles. I decide where I post the information according to interest, audience, and other factors. If a topic is posted here, I’m interested in interviews, discussions, podcasts, infographics, ideas, and data related to it. Feel free to contact me via email (ken-at-kenhess-dot-com) or Twitter (@kenhess) to continue the dialog. Please read the complete list of needs and the list of things I’m not looking for.